It’s a short white cylinder with an angled top surface, decorated with four small dots using the colors from Google’s logo — red, yellow, green, and blue. And it will soon be ready to answer your questions, play your favorite songs, check the traffic on your morning commute, and dim the lights in your bedroom. 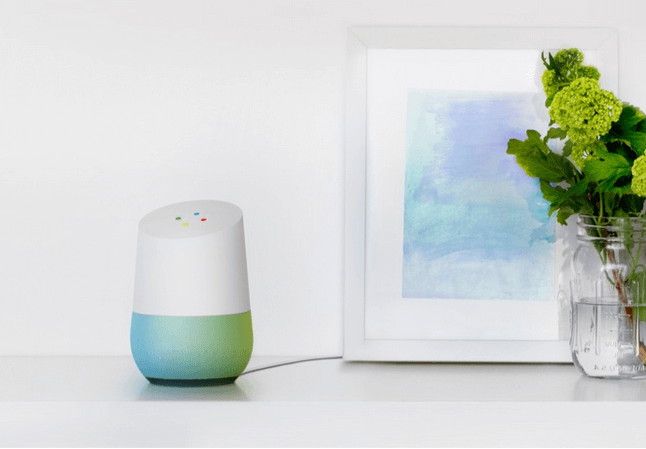 “Google Home” finally made its first public appearance on Wednesday at this year’s I/O conference in Mountain View, California. The device is scheduled for release later this year. Right now its web page only offers a 28-word description, plus a form where you can enter your e-mail address to receive updates — and some tantalizing images. There’s the Google Home unit in a kitchen, standing unobtrusively next to salt and pepper shakers. Then it’s on a nightstand, next to a dim lamp and a white flower in a vase, and then on a desktop next to a framed painting. “Always on call,” reads Google’s tagline. But everyone knows what it really is. Google’s answer to Amazon Echo. But there’s no API yet for developers, reports The Verge, saying the device “is going to work with a smaller set of home automation devices,” probably including lights and thermostat. But Google’s working hard to maximize its usefulness, and on Wednesday announced a new smart messaging app called Allo. It can anticipate possible responses, apparently eliminating the need to type out things like “Yes, I’ll be coming home for dinner” after the app has already seen you typing out several similar messages. Ok Google, unlock the front door. DAMNIT [sic] GOOGLE UNLOCK THE FRONT DOOR! Now the biggest question left may be what to make of this Brave New Google World. In an unfortunate coincidence, Sunday updates began appearing about a lawsuit against Google involving 890 college students in California who said Google scanned their emails to target advertising with their “Apps for Education” product. Many other comments echoed the inevitable concerns about privacy. “Never EVER under any circumstances would I put a closed-source cloud-connected always-on microphone in my house,” one person wrote. But the big thing that changed this week is a Google home device is no longer a theoretical possibility. It’s here. And on a sunny day at the outdoor amphitheater, just a half mile away from the Googleplex, the audience watched as a video showed the device at work in the home of a typical American family. The song playing gently in the background was “Home” by Phillip Phillips. There was laughter when the dad broadcast his playlist into every room in the home, waking up his sleeping children — and then later remotely turned on the lights to make sure that his son was up. Text messages were sent, dinner reservations were changed, all using Google Home, and it even answered a child’s questions using YouTube video clips on the family’s widescreen TV. “That’s cool,” someone in the audience murmured, and at the end of the presentation, the audience applauded loudly. LinkedIn realizes a 2012 breach actually exposed 117 million passwords, not 6.5 million. Police vs. botnets — can big data help? San Diego to run 100 percent on renewable energy by 2035. Bill Gates’ recommended reading list for 2016 (with video). In the United Kingdom, the Queen weighs in on drones and self-driving cars. New Jersey power company hopes to install solar panels on old dumps and industrial sites. Experience “shareable energy” with the BioLite Base Lantern — a portable lighting solution that doubles as your own smartgrid. The 3Dvarius – an electric violin generated by a 3-D printer.